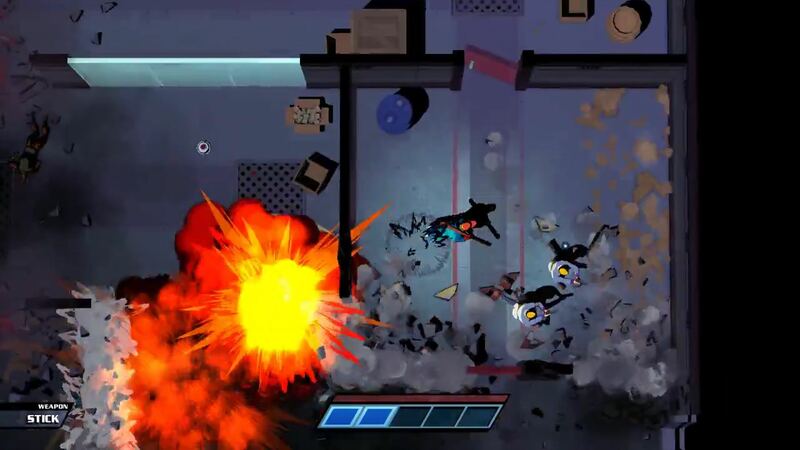 As much as I tried to avoid it, it is hard when talking about Mr. Shifty to avoid making comparisons to the exceptionally violent and brilliantly senseless Hotline Miami. I wanted to treat the game as its own thing but it is so clearly influenced by Hotline Miami that I just couldn’t help it. If you just watch the game in action, it will take you two seconds to make that judgement too. 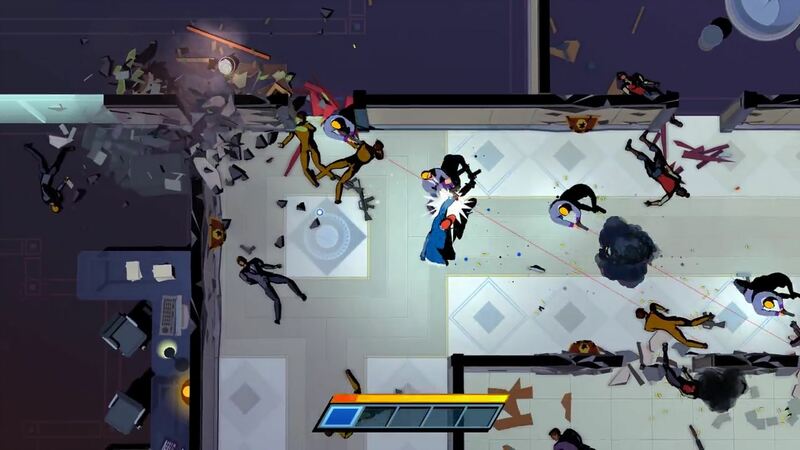 This isn’t to say that Mr. Shifty doesn’t bring any of its own ideas to the table because it certainly does, and to dismiss Mr. Shifty as merely a Hotline Miami clone would be doing a disfavour to the game and its developers. Because the biggest difference and main feature, as the game’s title hints at – is the ability to teleport short distances through obstacles and walls. But more on that later. 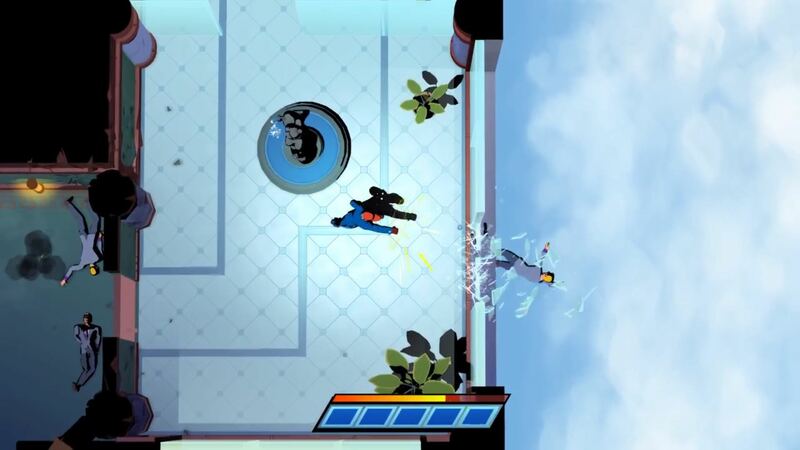 Mr. Shifty follows a teleportation-fuelled heist to break into a secure facility. But to be honest, it could have been about anything and it wouldn’t have made a single bit of difference. You see, this is a game that doesn’t need to rely on a ground-breaking story, it just needs to help the game tick along and it does just that just fine and that’s a good thing. Much like Hotline Miami, your main priority throughout the whole of the game is beating up bad guys. However, Mr. Shifty isn’t ultra-violent and there is, in fact, no blood or gore involved, you’re simply knocking them out, Batman style. You can use weapons, but there are no knives or guns of any nature that you can use, instead you can use weapons such as lead pipes and planks of wood. There are other weapons that are used for comedic reasons more than anything and whilst this is certainly not a super serious game by any stretch of the imagination, it still is a little silly that throwing ‘weapons’ such as pillows or fruit could one shot any enemy you encounter in the game, but one shot them it does. The game features a fair few different enemy types and you will naturally get to study which enemies to take down first or avoid until later as you get to know what each type of enemy does in terms of attack. I personally took down the guys who use the shotgun first as I had the most problem with these, so getting them out of the way first was a big step in winning the overall battle. Other variations can use machine guns, flamethrowers and grenades, to name a few. Most enemies take two punches to knock down but there are the brutes who take three, however, I never found these to be any trouble at all due to the fact that their weapons are their fists. Now we come to the teleport ability, the thing I love most about Mr. Shifty. By tapping the B button (or trigger, if you prefer) you will zip a small distance in the direction you are facing. This allows you to cross otherwise impenetrable walls, which can quicken things up a hell of a lot, rather than having to use doors like normal people do. So this means that if you have an enemy waiting for you on the other side of the door, you can walk round the side, teleport behind him and take him out before he can even react. It isn’t unlimited use, you can only use it 5 times in a short amount of time before it refills again. It’s a really great system, and it makes you feel like a badass. There is, however, a downside to this system, and that is it makes the game a little too easy. Those that enjoyed the challenge of Hotline Miami might be somewhat put off by Mr. Shifty’s difficulty by comparison. Once you made a mistake in Hotline Miami, that was it, you died. But in this game, you can make a mistake and easily rectify it by teleporting a few times out of harm’s way. You don’t have to plan your route through the level all that much either, you can just teleport into a group of enemies, hit a couple of them, and then teleport back out. Because of this, it does get slightly repetitive as you go on but the game does throw in some new elements from time to time to stop it from ever becoming too big of a problem. For example, there are areas the game gives you where you are unable to use your teleporting ability, so you can no longer rely on it and instead have to think of other ways to get through that particular section. And as mentioned before there are varied enemy types and they are introduced slowly. There are also sections where you have to avoid obstacles as there are explosions happening all around you. At the end of each level, you are given a time and a count of how many times you died. Whilst this is good for going back and trying to beat your time, it is a missed opportunity for having some other stats in there too such as your highest combo or how many times you used your shift ability. Having more of these in there would maybe convince me want to go back, even more, to try and beat my previous performance. Each level takes about 10 minutes to complete which was perfect for a pick up, play a level, and put it back down type of mentality. From start to finish the game took me just shy of 3 hours to complete. I then went back through a few of the early levels and managed to knock off another 10 minutes from the final time. So for those that are looking for a game that’s going to keep them going for a while, this isn’t that game. I do have to mention the frame-rate of the version I was playing. The game didn’t run great. However I never really found the slowdown to be too big of an issue and it certainly didn’t dampen my enjoyment of the game. Having said that, there were a couple of sections where the action got a bit too hectic and the game really chugged along for lengthy periods of time. The developers are working on a patch for the game that wasn’t out in time for when I was playing the game but may be out by the time you read this review. So, in that case, you can probably just skip over what I just said. I found Mr. Shifty to be a really fun and enjoyable game, that had a great core mechanic and played like one of my all-time favourite games. The challenge isn’t quite there however and it does get a bit repetitive the more you go on. There isn’t a great deal of replayability besides beating previous times, which isn’t enough to keep me coming back. But for those who want a short-lived but super slick and really fun game then I can certainly recommend Mr. Shifty to those people. It’s no Hotline Miami beater, but then again, what is?